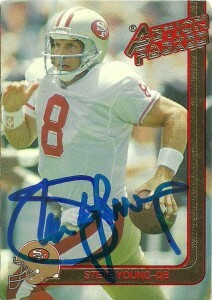 From what I understand, Steve Young has been rumored to be an ‘autopenner’. Autopenning is a relatively new and ruthless thing that players can do to fans hoping for an authentic autograph from them. An autopen is a machine that will line up the card and simulate the player’s signature. While I’m not sure what to think of this, many fans decry it because it lessens the interaction between the fan and the player and thus- it is not authentic. I could see how this would anger somebody who had his rookie card and really wanted him to sign it but for these two cards, it wouldn’t really bother me either way. GameDay came onto the scene in 1992. That along with Skybox and Action Packed were about all I’d collect before I stopped buying football cards during the 1993 season. From there on out my card collecting became sporadic and based solely on teams and players I wanted. GameDay had some really nice cards with their unique design that represented a ticket. The frames are cropped in just a certain way that the players would appear to burst right off the card edge and this Steve Young card is an exceptional example. Steve Young is another player who just got no respect- but in his case, he went out and proved them all wrong. 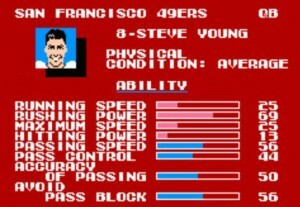 As you can tell from these two cards, Steve Young is doing what he does best- run. After graduating from BYU, Steve Young signed a then record 10 year 40 million dollar contract with the Los Angeles Express of the USFL. He’d lead the team to the playoffs his rookie season but in 1985 the league financially hemorrhaged. Steve would be the first player selected in the USFL supplemental draft by the Tampa Bay Buccaneers. After a rough 2 seasons with the Bucs, the 49ers would pull the trigger and trade for the beleaguered quarterback after Tampa Bay drafted Vinny Testaverde with the first pick of the 1987 draft. Young was considered a loose cannon on the field by Tampa. Forced to improvise due to a patchwork line, Steve would frequently scramble, and in two seasons had only won 3 games in 19 starts. For points and purposes he was a bust and discarded for a 2nd and 4th round choice from the Niners. Steve’s rebirth would begin in San Fransisco as future HoFer Joe Montana’s backup. He’d become the league’s best insurance premium, tutored by coaching wiz Bill Walsh and his offensive staff. As Young would bide his time, Montana’s age and frailty would emerge, and at some points a quarterback controversy would emerge. In 1991 after Montana was sidelined for the season, it was largely believed that this was Young’s shot at being the team’s starter, but after injury and relative ineffectiveness- Young would be locked in a quarterback controversy with Steve Bono briefly losing the job to him. He would recover the starting job, but the team only won 10 games and missed the playoffs. Young would respond by leading the team to the NFC Championship game the next season in 1993, and was named the league’s offensive MVP. Despite his accomplishments, Young would still have to suffer with fans and the owner expressing their desire to see Montana return to the starting role. With Bono and Young in the fold at the beginning of 1994 though, Montana was expendable to the 49ers and they traded him to greener pastures in Kansas City ending all controversy. Steve would lead the 49ers to SuperBowl victory at the conclusion of the season and was named NFL MVP again setting an NFL record completing over 70% of his passes. With Young under center the 49ers always were a threat while consistently making the playoffs throughout the 1990s, but Steve suffered multiple concussions due to his competitive style, 290 sacks, and refusal to dive with his feet. He’d retire at the conclusion of the 1999 season, refusing an offer to join Mike Shannahan in Denver. After posting a 3-16 record in Tampa, Young would go 91-33 with the 49ers. Since football, Steve has remained active in his charity “The Forever Young Foundation”- which serves children who face significant physical, emotional, and financial challenges by providing academic, athletic, and therapeutic opportunities unavailable to them. He is also a commentator on the NFL draft and also ESPN. He is avidly involved in Utah Sports and is the great-great-great grandson of Brigham Young.